No patient details, just the take home lessons. If you have time, resuscitate and optimize your patient’s hemodynamics prior to intubation. Positive pressure ventilation will decrease venous return to the heart and patients who are hemodynamically unstable to start with are at risk for cardiovascular collapse/arrest. You can use push dose pressors in this situation. Epinephrine can be used. Simple way to do this: Put 1ml of cardiac epinephrine in a syringe with 9ml of saline. You can give 1 ml every few minutes to optimize hemodynamics. When approaching a difficult airway, give yourself your best chance for first pass success. If you fail on your first attempt, the potential for bad outcomes increases significantly. Ken Dodd says your best chance for success on first attempt is video laryngoscopy using a standard mac VL blade and intubating with a bougie and then placing the tube over the bougie. Have a LMA as back up. Be prepared for a surgical airway. Consider using ketamine sedation and topical anesthetic and avoiding neuromuscular blockers when managing a difficult airway. Jefferson Fracture can be tough to diagnose. Note the lateral masses of C1 extend beyond the lateral borders of C2. That signifies Jefferson burst fracture. In a normal C-spine the lateral borders of C1 and C2 should line up pretty much perfectly. Associated C2 fractures occur in approximately one half of patients. Patients with multiple ED presentations for the same episode of back pain are at high risk for serious diagnoses. Patients with new onset psychosis may benefit from CT imaging of the brain. Don’t attempt to replace a g-tube if it has been placed within the last 4 weeks. If a new g-tube (less than 4 weeks) has fallen out, just admit the patient and consult gen surg or GI. Sickle Cell Disease is a risk factor for rhabdomyolysis. A marker for rhabdomyolysis in a sickle cell patient is an abnormal AST or ALT. Case 1. 43yo male with leg pain and redness. Patient had a fish hook injury to his leg recently in salt water. Skin exam shows severe cellulitic changes, bullae and crepitence. Labs c/w sepsis with elevated WBC and lactate. X-rays show show soft tissue air. Diagnosis was soft tissue infection from vibrio vulnificus. Treat with 3rd Gen Cephalosporin and Doxycycline or flouroquinolone. Dr. Lovell point: Think Vibrio vulnificus with salt water source infection and Aeromonas for fresh water source infection. You can treat both with flouroquinolone. Case 2. 16 yo male with syncope and facial contusion. Patient had syncope after swimming and injured his mouth. EKG showed short PR interval. Patient had Lown-Ganong-Levine syndrome Short PR interval with no delta wave. The Lown–Ganong–Levine (LGL) syndrome is now believed to be due to enhanced AV nodal conduction. The proposed mechanism is an intranodal bypass tract or atrionodal tracts formerly known as James fibers. This diagnosis has been largely abandoned in the era of electrophysiology. Syndrome diagnostic criteria classically have been: a short PR interval (less than 0.12 s) and a normal QRS complex on ECG, and the clinical history of intermittent palpitations or episodes of paroxysmal SVT, atrial flutter, or atrial fibrillation. Case 3. 31yo male presents with elbow pain. Patient was recently scuba diving. Vitals and physical exam of the elbow are normal. Xrays of the elbow are normal. Labs are normal. Arthrocentesis was done and the joint fluid analysis was normal. Diagnosis was the decompression sickness. Treatment is hyperbaric O2. Dr. Lovell point: Decompression sickness and arterial gas embolism are both indications for hyperbaric oxygen. Dr. Regan discussed radiation physics. Here is my attempt at a descriptive analogy. Think of a Gray as 1 dollar. Think of a rad as a penny. There are 100 rads in a Gray. (100 pennies in a dollar). When a rad hits the body it is then measured as a miliseivert. Think of this as taking your dollar and bringing it to a currency exchange to purchase euros. 1 rad will buy 10miliseiverts. 300 rads or 3000 miliseiverts of radiation exposure is very dangerous. 600rads/6000 miliseiverts is almost always fatal. Decontamination for radiation-exposed patients presenting to the ED is primarily removing their clothing and irrigating them with copious water. You then test them with a Geiger counter. They are OK to go into the hospital when you get their radiation down to 2X the ambient radiation level. You can also Geiger count their urine and a nasal swab to check for internal radiation. Nuclear Medicine Dept has Geiger counters. Get CBC’s on radiation-exposed patients every 2 hours. Personnel doing radiation decontamination have to be specially trained and wear a level C hazmat suit. High Order explosives like TNT, C4, Semtex create a well-defined pressure wave and cause primary blast injuries. Low order explosives like pipe bombs do not create a well-developed pressure wave and don’t cause primary blast injuries. Patients exposed to bomb blasts will develop lung finding relatively rapidly so you can order CXR or CT Chest early in ED course. ECMO is basically a placenta-like form of oxygenation for critically ill patients. ECMO gained traction in adults for management of military blast injuries and treatment of fulminant lung injury due to influenza. Veno-venous ECMO bypasses the lungs but the heart still pumps the blood. Veno-Arterial ECMO bypasses the lung and the machine pumps the blood. V-A ECMO can perfuse in cardiac arrest. The literature is not super strong in support of ECMO but it is trending toward better outcomes. A 2016 study showed 50% survival for out of hospital V-Fib arrest who received ECMO therapy. There are some EM centers doing ECMO for selected cardiac arrest patients. You can also use ECMO for cardiogenic shock. Other indications: electrical storm, heart block, ARDS, severe tox cases, hypothermia/hyperthermia, and blast lung injury. As emergency physicians, we can advocate on behalf of our patients for doing ECMO in select situations. This means consulting with ICU and CV surgery specialists in the appropriate clinical scenario. Critical Care in the future may see ECMO replacing intubation and positive pressure ventilation. That is because positive pressure ventilation is so deleterious to patients. PCP is the most common opportunistic infection among AIDS patients.21 The causal agent is known as P. jirovecii (previously known as P. carinii). Approximately 70% of HIV-infected patients acquire PCP at some time during their illness, and PCP is often the initial opportunistic infection that establishes the diagnosis of AIDS. This infection is the most frequent serious complication of HIV infection in the United States and the most common identifiable cause of death in patients with AIDS. The classic presenting symptoms of PCP are fever, cough (typically nonproductive), and shortness of breath (progressing from being present only with exertion to being present at rest). Symptoms are often insidious and accompanied by fatigue. Chest radiographs most often show diffuse interstitial infiltrates (Table 154-3), but negative radiographic findings exist in 15% to 25% of patients with PCP.22 The lactate dehydrogenase level is elevated in patients with PCP, but this test has low sensitivity and specificity, impairing utility. Arterial blood gas analysis usually demonstrates hypoxemia and an increase in the alveolar-arterial gradient. Suspect early PCP if a patient demonstrates a decrease in pulse oximetric values with exercise; even an ED "walk" can detect this exercise desaturation. Presumptive diagnosis of PCP is often made in the ED if there is hypoxemia without any other explanation. Inpatient diagnostics include bronchoscopy with specimen analyses. Initial PCP therapy is trimethoprim-sulfamethoxazole (Table 154-2) PO or IV for 3 weeks (2 double-strength tablets three times daily). Adverse reactions, including rash, fever, and neutropenia, occur in up to 65% of AIDS patients. Pentamidine is an alternative agent (Table 154-2). Give steroids to patients with a partial pressure of arterial oxygen of <70 mm Hg or an alveolar-arterial gradient of >35 mm Hg, usually oral prednisone starting at 40 milligrams twice daily and tapering over 21 days (Table 154-2). Dr. Lovell comment: Dr. Triteman is an ID specialist here a ACMC who has a HIV Clinic. You can contact him to arrange follow up for newly diagnosed HIV patients who are stable for discharge. Bowel perforation from blunt abdominal trauma can present to the ED days after injury. If a patient has bowel perforation from blunt abdominal trauma, you have to consider that the patient may have some underlying bowel pathology such as crohn’s or ulcerative colitis. Oxygenation and ventilation keep the patient alive. These are different than intubation which places a tube in the patient’s trachea. Remember when you are attempting to intubate that you also need to focus on oxygenation and ventilation. Preoxygenate with high flow O2 and ventilate with spontaneous respirations if adequate or assist with BVM, BiPap, or even LMA. Don’t let the procedure of intubation distract you from maintaining adequate oxygenation and ventilation for the patient. Intubation safety is about preparation and mindset. Have 2 back up plans. Discuss your primary approach and back up plans with your team before you start your first attempt at intubation. Make sure your team has a shared mental model of how you are going to manage the airway. Optimize your first attempt. If the first attempt fails, the incidence of bad outcomes increases. Specificity of the Lemon assessment is 86%. Sensitivity however is low <70%. Basically if you have signs of a difficult airway it will be difficult. If you have no signs of a difficult airway the Lemon assessment may fail you and the airway may still be difficult. Pre-Oxygentate with a non-rebreather mask using “flush rate” wide-open wall oxygen. In addition to a NRB mask, also apply nasal canula O2 at 15L for passive oxygenation. Preoxygenate patients semi-upright. The semi-upright position improves functional residual capacity and decreases atelectasis. Thenar Grip with patient semi-upright. Patient has apneic oxygenation with nasal cannula in addition to oxygen through BVM at wide open “flush rate”. A peep valve is in place on the BVM. Peep valves improve pre-oxygenation. Dr. Dodd recommends making your first attempt with macintosh style video laryngoscopy blade and a bougie. Then placing ET tube over the bougie into the trachea. Here’s a summary of the BEAM Trial demonstrating that using a bougie as your first attempt improves first pass success. One caveat: you can’t use the bougie with a hyperangulated VL blade. You have to use the glidescope stylet when using the hyperangulated blade. Unfortunately I missed this outstanding lecture. These are the Criteria for a medical center to have a Level 1 Trauma designation. Since 2016 CFD criteria for a patient meeting trauma criteria includes patients 55yo and older who fall from standing position and hit their head. Bypass means that BLS and stable ALS patients get diverted unless the other hospitals are on bypass. Patients that fall into these categories cannot be bypassed to another institution. Bypass is a courtesy. BLS and stable ALS patients can still go to the waiting room. Cases that are exempt from bypass are Trauma, STEMI, CVA, full arrest, respiratory distress and those with unstable vital signs. These patients are still going to arrive in our ED whether or not we are on bypass. In consultation with the House Supervisor, and the ED Lead Physician, it is the role of the ED Charge Nurse to activate bypass. All monitored beds in the hospital need to be occupied. Also any Internal Disaster would prompt a bypass decision. On average, bypass diverts 1.7 patients/hour. The effect on ED patient volume is not that significant. IDPH is investigating how hospitals are using bypass to see if an alternative system is possible. Case 1. 54 yo female patient presents after resuscitated cardiac arrest. Patient became nauseated at a restaurant and was found unresponsive in bathroom. Exam shows urticaria. Patient became hypotensive again in ED. Diagnosis was anaphylaxis and treatment initiated including epi drip. If you have suspected allergic reaction and two systems are involved or the patient is hypotensive, diagnose anaphylaxis and give Epi. There is no contraindication to Epi in the setting of anaphylaxis. Anaphylaxis treatments. First line therapy is EPI. Everything else second line to EPI. One additional pearl, if patient is on a beta blocker and has hypotension refractory to EPI, you can try glucagon 1mg IV Q 5 minutes. Case 2. 15 yo female patient presents with knee injury while playing soccer. Patient’s knee exam was as pictured. Xray confirmed lateral patellar dislocation. Case 3. 28 yo female present with rash. Patient had EM rash. Erythema multiforme (EM) is an acute inflammatory skin disease (Figure 249–1) with a broad range of severity, from a minimal, nuisance-level event to a severe multi-system illness. It is divided into two distinct sub-types, considering the extent of involvement, presence of epidermal detachment, and the development of mucous membranes lesions. Erythema multiforme minor, the less severe form of the illness, is a localized papular eruption of the skin, with an acral distribution and involving target lesions and/or raised, edematous papules. Erythema multiforme major is the more severe form of EM with multi-system involvement and widespread vesiculobullous lesions and erosions of the mucous membranes; specifically, EM major includes involvement of one or more mucous membrane areas and epidermal detachment less than 10% of total body surface area. Yolk sac is the first structure visible of an IUP at about 5-6 weeks. Fetal cardiac activity comes later at about 8.5 weeks. Live IUP has to have gestational sac with fetal pole and cardiac activity in the uterus. The endometrial stripe needs to surround the gestational sac/fetal pole/heart. IUP has a yolk sac and fetal pole without cardiac activity within the endometrial echo of the uterus. If the pregnancy is not within the endometrial echo then the pregnancy is extrauterine (ectopic). You should have Gyne consult formally on a patient in ED if the patient has abnormal vitals, significant pain, fluid in the pelvis or adnexal mass identified on ultrasound. When US reveals an unequivocal IUP and no other abnormalities, ectopic pregnancy is effectively excluded unless the patient is at high risk for heterotopic pregnancy. An embryo with cardiac activity seen within the uterine cavity is referred to as a viable IUP. When an embryo without cardiac activity is visualized within the uterus, the diagnosis of fetal demise can be entertained, provided that the crown–rump length is at least 5 mm. Briefly, transvaginal scanning can usually visualize the early sonographic signs of pregnancy, the gestational sac, yolk sac, and fetal pole, at 4.5, 5.5, and 6.0 weeks, respectively. Visualization by transabdominal scanning can be done approximately 1 week later. Chest pain in children is rarely cardiac in nature. Cardiac issues in kids rarely present with chest pain. Asthma and reactive airway disease are common causes of chest pain. Pediatric coronary arteries rarely get stented because the stented artery will not grow with the child. Consequently the child who has a coronary stent, as they mature and grow, will have a fixed size coronary artery due to the stent and have coronary insufficiency the rest of their life. Anomalous coronary artery can result in coronary insufficiency. Anomalous coronaries branch off the wrong part of the aorta and branch off at an acute angle. Both result in reduced flow. Kawasaki’s aneurysms can cause chest pain. Cocaine and marijuana can cause pediatric chest pain. Arrhythmias can be a cause of chest pain. Pericarditis and myocarditis. Myocarditis is a high risk diagnosis that can have serious morbidity and mortality. Think about myocarditis with in patients with fever, tachycardia, and recent viral illness associated with their chest pain. Hypertrophic cardiomyopathy can cause chest pain. The hypertrophic septum can block the LV outflow tract and decrease coronary flow. HOCM causing chest pain will have significant murmur. Aortic stenosis or pulmonary stenosis are valvular causes of chest pain and will have a murmur. The high-risk diagnoses for pediatric chest pain are anomalous coronary artery, hypertrophic cardiomyopathy and myocarditis. Anomalous coronary artery can be very difficult to diagnose. You won’t be able to definitively diagnose it in the ED if the patient does not have EKG changes. If their pain has resolved the EKG changes may have resolved as well. Consider anomalous coronary artery if the patient has exertional chest pain. Hypertrophic cardiomyopathy causes syncope or sudden death more commonly than chest pain. If it is causing exertional chest pain there will be a prominent murmur. Myocarditis may have tachycardia, EKG changes, signs of heart failure, elevated troponin, or recent history of viral illness. The incidence of PE in pediatric patients is increasing. There is a bimodal age distribution (neonates and teenagers). Screen with a d-dimer level over 0.75. Congenital heart disease, Long QT and Brugada do not present with chest pain. Myocarditis is the highest risk diagnosis that if sent home is most likely to have a bad outcome. Myocarditis can be identified by abnormal EKG, tachycardia, and elevated troponin. The patient may have an elevated troponin or history of recent viral illness. ACA Guideline for kids age 5-18: Ask about exertional chest pain. It is a Red Flag historical finding. Ask for family hx of cardiomyopathy, early CAD, and sudden death. Perform a physical exam for murmur and lung sounds. Get an EKG. Get an echo for exertional chest pain patients, patient with high risk past medical or family history, murmur, or abnormal EKG. Echo may not need to be emergent. Asymptomatic patients in the ED can be discharged home with activity limitation and pediatric cardiology follow up. Kane, DA. Congenit Heart Dis. 2010;5(4):366–373. Holter monitor will capture every beat for 24 hours. Event monitors are worn for 30days and capture 15 min recordings retrospectively from the time the patient voluntarily triggers the device when having some symptoms. Kids with psychogenic chest pain referred to cardiology usually end up getting extensive workups with echo, event monitors and stress tests. Diagnosis was pericardial tamponade due to autoimmune disease. Treatment is IV fluid resuscitation and consulting for or performing pericardiocentesis. Case 2. 39 yo male presents with a seizure. Blood sugar is normal. Patient received IM midazolam in the prehospital phase with continued seizure. IV Ativan in ED did not terminate seizure. Patient had recent history of positive PPD for employment screening. Patient has been taking isoniazid. Patient was treated with standard medications for status epilepticus with no improvement. B6 (pyridoxine) was given next which terminated seizure. Diagnosis was seizures secondary to isoniazid. These symptoms may progress to the three classic features of acute isoniazid overdose: seizures, metabolic acidosis, and protracted coma.46,47 Seizures typically follow acute isoniazid ingestions of greater than 20 to 30 milligrams/kg. Isoniazid-induced seizures are generalized tonic-clonic in nature and are often refractory to standard anticonvulsive therapy with benzodiazepines and barbiturates. The mechanism for isoniazid-induced seizures is a functional deficiency of pyridoxine (vitamin B6) and inhibition of the synthesis of γ-aminobutyric acid, the primary CNS inhibitory neurotransmitter. Seizures with therapeutic doses of isoniazid have been reported in patients,48 presumably due to very low vitamin B6 levels.49 Although the metabolic acidosis that accompanies isoniazid-induced seizures is likely due to motor activity, the lactic acidemia may not resolve as rapidly as with other more typical epileptic seizures. Consider isoniazid overdose in patients with refractory seizures.44 Isoniazid-induced seizures are treated with a combination of benzodiazepines and pyridoxine. The dose of pyridoxine is a gram-for-gram equivalent to the amount of isoniazid ingested.50 For patients who ingest an unknown quantity of isoniazid, the recommended dose of pyridoxine is 5 grams IV in adults and 70 milligrams/kg (maximum 5 grams) in pediatric patients. Pyridoxine may be administered at a rate of approximately 1 gram IV every 2 to 3 minutes until the seizures stop or the maximum dose has been given. After the seizures have ceased, the remainder of the pyridoxine dose should be given over the following 4 to 6 hours to limit recurrent seizures. Case 3. 79 yo male patient presents with abdominal pain. Abdominal exam showed peritonitis. Diagnosis was perforated viscous causing abdominal pain. Treatment is IV crystalloids, IV antibiotics, and surgical consultation. For ETOH dependent patients who are withdrawing, follow the CIWA score and if it is increasing consider higher level of care dispo such as step-down. If a patient has a history of prior ICU admit consider step-down admission. Dr. Ryan comment: If a patient has 2 medical problems such as alcohol withdrawl and pancreatitis you may want to consider a step-down admission. PAWS score on MD Calc can be used to risk stratify alcohol withdrawal patients. At scores >/=4 consider step-down or ICU admission. Sending home first trimester pregnant patients with vaginal bleeding has risks. To mitigate risk, be sure to give very clear return instructions to the patient so that they come back right away for abdominal pain, vaginal bleeding, lightheadedness, or any other symptoms. Dr. Ryan comment: The patient going home has to understand that pain, bleeding, or lightheadedness is not expected for a normally progressing pregnancy and any of these symptoms should prompt return to the ED. Patients with fever and encephalopathy need to be considered for LP. Consider meningitis if you don’t have another clear cut-source of infection and the patient’s mental function is significantly different from baseline. Too much IV fluids is a risk for increased morbidity and mortality in sepsis patients. 50% of sepsis patients are fluid-responsive. The other 50% non-responders are further along on the Starling curve and additional fluids don’t help. You can assess fluid responsiveness in the ED most simply by assessing for improvement of blood pressure/MAP with a 250ml fluid bolus or 3minutes of passive leg raise. There aren’t many other ways to accurately assess volume status in septic patients. Dr. Tyler recommended that the best was the calculating the VTI at the LV outflow tract using bedside echo. Low VTI suggests that the patient could use more fluids. IVC evaluation on bedside U/S is not useful generally unless the IVC is extreme on either side (totally collapsing or totally plethoric). 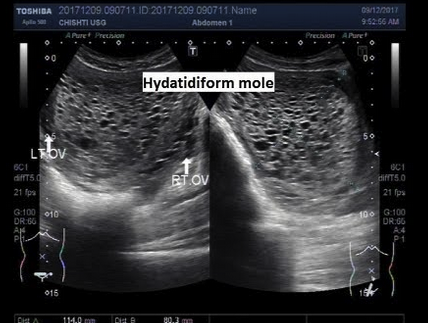 You can use the IVC as a dynamic assessment of fluids status before and after fluid administration. If the IVC looks more full after a 250ml bolus you can take that as fluid responsiveness. IVC showing collapse which in the right clinical context as a dynamic evaluation of fluid responsiveness may indicate need for more volume. Ultrasound lung windows showing B lines are useful to assess for pulmonary edema. Causes of elevated lactate: sepsis, tissue hypoxia, accelerated aerobic glycolysis (example is continuous albuterol med nebs), liver dysfunction, malignancy, medications, toxic alcohols, DKA, and thiamine deficiency. On the other hand a normal lactate does not rule out serious problems. Dr. Tyler is giving IV fluids to his sepsis patients who are fluid responsive in 500ml to 1 liter boluses and re-assessing prior to giving more fluids up to the 30ml/kg target. Move to norepinephrine if you assess that patient is not improving with IV fluids. We are the masters of acute care and resuscitation. Billing criteria for Critical Care: High probability of significant or life threatening deterioration. If the patient cannot be managed in an office or if you did nothing, something bad would happen, that fits the definition of critical care. In your note, document the patient was critically ill and had risk of significant deterioration. You also need to document complex decision making and your total time involved in critical care not including procedure time. You need to document re-evaluations of the patient. It is helpful to document your interpretation of pulse ox, monitor, diagnostic testing and vital signs to support your critical care billing. It is also helpful to document that you discussed case with family and consultants. Procedures such as intubation, arthrocentesis, lumbar puncture, and chest tubes are billed separately. You can bill critical care for patients that you intervene on in the ED and because of your care, they no longer need ICU admission and get admitted to the floor. This would include clinical situations such as severe asthma, severe COPD exacerbation, and anaphylaxis. Case 1. 70 yo female patient presents with altered mental status. Patient is tachycardic and hypotensive. Patient’s temperature is 106F. Diagnosis is heat stroke with rhabdomyolysis. Case 2. 8 yo male patient was playing in the woodshed and came into the house screaming in pain. Patient had persistent pain despite IV morphine. There appears to be a spider bite on exam. Diagnosis was black widow spider bite. The bite mark itself tends to be limited to a small puncture wound or wheal and flare reaction that often is associated with a halo (Table 115–3). However, the bite from L. mactans produces latrodectism, a constellation of signs and symptoms resulting from systemic toxicity. Some cases do not progress; others show severe neuromuscular effects within 30 to 60 minutes. The effects from the bite spread contiguously. For example, if a person is bitten on the hand, the pain progresses up the arm to the elbow, shoulder, and then toward the trunk during systemic poisoning. The myopathic syndrome of latrodectism involves muscle cramps that usually begin 15 to 60 minutes after the bite. The muscle cramps initially occur at the site of the bite, but later involves rigidity of other skeletal muscles, particularly muscles of the chest, abdomen, and face. The pain increases over time and occurs in waves that cause the patient to writhe. Large muscle groups are affected first. Classically, severe abdominal wall spasm occurs and is confused with a surgical abdomen, especially in children who cannot relate the history to the initial bite.38 Muscle pain often subsides within a few hours but can recur for several days. Transient muscle weakness and spasms is reported to persist for weeks to months. In the past, 10 mL 10% calcium gluconate solution was given IV to decrease cramping. However, a retrospective chart review of 163 patients envenomated by the black widow concluded that calcium gluconate was ineffective for pain relief compared with a combination of IV opioids and benzodiazepines.56,138 Another study found greater neurotransmitter release when extracellular calcium concentrations were increased, suggesting that administration of calcium is irrational in patients suffering from latrodectism.191 The mechanism of action of calcium remains unknown, and its efficacy is anecdotal; therefore, we do not recommend calcium administration for pain management. Although often recommended, methocarbamol (a centrally acting muscle relaxant) and dantrolene also are ineffective for treatment of latrodectism.138,196 A benzodiazepine, such as diazepam, is more effective for controlling muscle spasms and achieves sedation, anxiolysis, and amnesia. Management should primarily emphasize supportive care, with opioids and benzodiazepines for controlling pain and muscle spasms, because the use of antivenom risks anaphylaxis and serum sickness. Signs and symptoms of the classic form include an ascending symmetric weakness or paralysis and areflexia or hyporeflexia. Paralysis may ascend to the diaphragm, compromising respiratory function and requiring mechanical ventilation. Autonomic dysfunction may be present as well. Cerebrospinal fluid analysis shows high protein levels (>45 milligrams/dL) and WBC counts typically <10 cells/mm3, with predominantly mononuclear cells. When there are >100 cells/mm3, other considerations include HIV, Lyme disease, syphilis, sarcoidosis, tuberculous or bacterial meningitis, leukemic infiltration, or CNS vasculitis. Electrodiagnostic testing demonstrates demyelination. Nerve biopsy reveals a mononuclear inflammatory infiltrate. If MRI is performed to rule out alternative diagnoses, it will show enhancement of affected nerves. The first step in management is assessment of respiratory function. Airway protection in advance of respiratory compromise decreases the incidence of aspiration and other complications. A well-established monitoring parameter is vital capacity, with normal values ranging from 60 to 70 mL/kg. Avoid depolarizing neuromuscular blockers like succinylcholine for intubation in Guillain-Barré syndrome due to the risk of a hyperkalemic response. The upper lip bite test. If the patient can’t bite their upper lip even a bit (picture C), that is a sign of a difficult airway. Upper lip bite test had a sensitivity of 70% and a sensitivity of >85% and an accuracy of >85% for predicting a difficult airway. 2018 Cochrane review by Roth showed that all our airway evaluation tests have relatively low sensitivity and high specificity. Not what you want in a screening test. There are no high sensitivity bedside screening tests for predicting a difficult airway. This test was the best. With a prevalence of 10%, 10 out of 100 patients will have difficult laryngoscopy. Of these, 3 will be missed by the upper lip bite test(33% of 10). Of the 90patients without difficult laryngoscopy 7 will be unnecessarily classified as having a difficult airway. It is the editor’s opinion that it makes sense to consider BMI, neck thickness and mobility, some form of mallampati, do a 3-3-2 and assess mandibular movement if possible with the upper lip bite test. This review looked at many scoring scales and receding jaw and mandibular movement were consistent factors in difficult airways. One investigator used basically this combination of screening tests and had pretty spot on prediction of a difficult airway. Inhaled nitrous oxide can be used to manage severe pulmonary hypertension. Dr. Florek comment: Jaw thrust maneuver can be used to assist fiberoptic intubation. It opens up some additional space in the upper airway to maneuver the fiberoptic scope. Dr. Harwood comment: In the patient with significant upper airway bleeding, use 2 yankaur suction devices to improve clearance of blood from the airway. This lecture was sent out in PDF form to all the residents. “A wealth of information creates a poverty of attention” It is tough to balance enough info with too much info. Too much info in a handoff can cause the receiving physician to become distracted. Emergency physicians and Admitting physicians have different perspectives on a specific patient. We are thinking acute care and they are thinking longer term hospital course. We frequently don’t appreciate the stressors that admitting physicians are feeling. Use of a standardized process, understood by both teams, that covers patient care info important to both teams, can be helpful in decreasing communication breakdowns. Dr. Delbar reviewed the recent literature regarding inter Unit transfers. Editor’s note: SBAR is a very widely accepted handoff tool that can be used. Giving your handoff in a standardized way covering: S situation B background A assessment and R recommendation may be helpful in improving handoff communication. Case 1. 30 yo female patient presents with syncope. Patient was tachycardic and hypotensive. Patient had some abdominal tenderness. Further history revealed that patient had a fall about a week earlier on to her left side. On FAST, patient has free fluid in morrison’s pouch. Diagnosis was splenic rupture. Patient required IVF and IV PRBC’s to resuscitate and get to OR for surgical management. According to the American College of Surgeons (ACS), mortality from splenic injuries accounts for approximately 10% of all trauma-related deaths . In 1998, Cocoanour stated that the incidence of delayed splenic injury was approximately 1% . However, in 2017, Furlan et al. reported that the incidence of delayed splenic injury has risen to 3%-15% with an inconsistent association with the severity of splenic trauma . Compared to the 1% mortality associated with acute splenic injury, the mortality from delayed diagnosis of splenic injury following blunt abdominal trauma ranges from 5%-15% . The trend in the increased presentation of delayed splenic injury is a risk of patient morbidity and mortality and can be attributed to the difficulty in identifying delayed splenic rupture. Difficulties with diagnosing delayed splenic injury may include atypical presentations that may mimic other pathologies, the lack of symptomatology, or equivocal imaging. Due to the variability in presentation and the difficulty with the initial assessment of delayed splenic injury, it is the opinion of the authors that delayed splenic rupture be considered in the differential diagnosis of an acute surgical abdomen regardless of the time or mechanism of the inciting event. Delayed rupture of the spleen remains a real diagnostic entity and may occur in 1% of blunt abdominal trauma victims. The process most likely results from rupture of pre-existent subcapsular hematoma of the spleen. Such a hematoma is likely the result of parenchymal injury that may or may not be detected by CT scan. Such delayed ruptures can present atypically and after minor trauma that may be interpreted by the patient to be insigniﬁcant, and therefore, forgotten. In these instances, continued clinical vigilance and early appropriate imaging will likely decrease morbidity. Case 2. 32 yo male patient with knee pain. Patient had concurrent paronychia on great toe of same lower extremity. 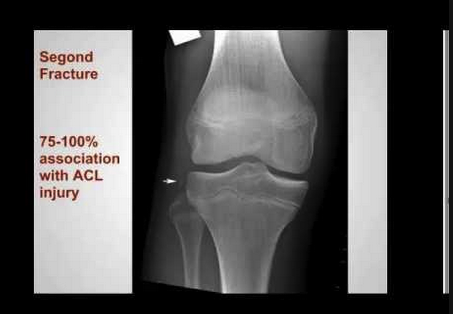 Arthrocentesis of knee shows 192,000 WBC’s. Most likely patient had hematogenous spread from paronychia causing septic arthritis. Treatment requires IV antibiotics and joint irrigation. Case 3. 39yo firefighter presents with confusion with shortness of breath. Patient is tachycardic. Patient was fighting a fire when his team members pulled him from the burning building. Exam shows soot and edema in nasal passages and oropharynx. Patient required emergent intubation to protect airway. Patient’s CO level was 22%. Patient also had 2nd degree burns on 25 %BSA. The initial diagnosis of smoke inhalation is made from a history of exposure to fire in an enclosed space and physical signs that include facial burns, singed nasal hair, soot in the mouth or nose, hoarseness, carbonaceous sputum, and expiratory wheezing. No single method for diagnosing the extent of inhalation injury exists. Measurement of arterial carboxyhemoglobin is used to document prolonged exposure to products of incomplete combustion. The chest radiograph may be normal initially. Bronchoscopy and radionuclide scanning may also be helpful in evaluating the full extent of injury. Patient also required crystalloid resuscitation per the Parkland formula and transfer to a burn center. There also needed to be discussion of hyperbaric O2 therapy for CO toxicity with receiving hospital. FBI definition: An Active shooter is an individual actively engaged in killing or attempting to kill people in a confined and populated area. The Emergency Department is the most common site for violence/shooting in a hospital. 23% of hospital shootings occurred due to a person taking a security guard’s or police officer’s weapon. Dr. Regan says, if you hear shots and don’t see a shooter, run! Don’t wait for others or stop to get your stuff. Dr. Cranmer says, it is common to downplay or ignore popping sounds. Don’t do this, be situationally aware and pay attention to those noises. If you hear gunshots or popping noises, discontinue patient care. Don’t stop for victims or try to protect patients. If you die, you can’t help the patients later. Get out of there! Your safety takes priority over co-worker or patient safety. If you are running down a long straight hallway zig-zag down the hall to make it harder for the shooter to hit you. Do not run along the wall of a hallway. Bullets tend to ricochet and fly along the wall. When you leave the building, keep your hands up and visible. Don’t have your cell phone in your hand. Don’t make any sudden movements. Don’t approach the police. Police are there to stop the shooter. You don’t want them to mistake you for the shooter. The meeting point outside our hospital for persons fleeing from an active shooter is the Ronald McDonald House. If you are hiding and have a cell phone, text to a person outside the hospital to notify the police. Use any object in a room to barricade the door. Don’t open the door to let others in the room. If someone knocks on the door and says they are the police, ask them to slide their badge under the door or provide some other form of verification that they are the police before opening the door. To report a shooter, call 41-1057 (Public Safety) and call 911. If you have to fight the active shooter, work as a team to attack the shooter. Multiple people coming at the attacker at once is harder for them to fight back. Fight dirty and fight hard. Your life is on the line. The inventory room is the safest room in the ED to hide/barricade in. It has heavy metal doors that can be locked. In the PED, the Inventory and storage rooms are the safer rooms with metal doors. The notification for an active shooter overhead in the hospital will be: Security Alert-Active Shooter-Location. There also may be Everbridge text notifications. Dr. Regan and Cranmer then covered specific scenarios and walked us through the ER to demonstrate escape routes and safe areas. This workshop was a real eye-opener for ED staff. There was much discussion about the ethical choices of protecting your personal safety vs staying with patients. Dr. Regan and Cranmer both emphasized the importance of protecting your personal safety so you stay alive to care for patients. Blunt trauma to the temporal or temporoparietal area with an associated skull fracture and middle meningeal arterial disruption is the primary mechanism of injury. Occasionally, trauma to the parieto-occipital region or the posterior fossa causes tears of the venous sinuses with epidural hematomas. The classic history of an epidural hematoma involves a significant blunt head trauma with loss of consciousness or altered sensorium, followed by a lucid period and subsequent rapid neurologic demise. This clinical presentation occurs in a minority of cases. Traumatic blows to the thin temporal bone over the lateral aspect of the head carry the highest risk (e.g., baseball or pool stick injury). The diagnosis of an epidural hematoma is based on CT scan and physical examination findings. The CT appearance of an epidural hematoma is a biconvex (football-shaped) mass, typically found in the temporal region. Subdural hematoma is caused by sudden acceleration-deceleration of brain parenchyma with subsequent tearing of the bridging dural veins. This results in hematoma formation between the dura mater and the arachnoid (Figures 257-8 and 257-9). Subdural hematoma tends to collect more slowly than epidural hematoma because of its venous origin. However, subdural hematoma is often associated with concurrent brain injury and underlying parenchymal damage. Brains with extensive atrophy, such as in the elderly or in chronic alcoholics, are more susceptible to the development of acute subdural hematoma. Even seemingly benign falls from standing position can result in subdural bleeding in the elderly. Children <2 years old are also at increased risk of subdural hematoma. Acute cases usually present immediately after severe trauma, and often the patient is unconscious. In the elderly or in alcoholics, chronic subdural hematomas may result in vague complaints or mental status changes. Often, there is no recall of injury. On CT scan, acute subdural hematomas are hyperdense (white), crescent-shaped lesions that cross suture lines. Subacute subdural hematomas are isodense and are more difficult to identify. CT scanning with IV contrast or MRI can assist in identifying a subacute subdural hematoma. A chronic subdural hematoma appears hypodense (dark) because the iron in the blood has been metabolized. Two things will “white out” a lung, pleural effusion and atelectasis. Pleural effusion shifts mediastinum away from the affected lung. Atelectasis pulls mediastinum toward the affected lung. Dr. Allam made the point that when checking NG tube placement, the NG tube should follow the spine until the NG gets below the diaphragm. If the NG tube is angling out laterally away from the spine in the chest you have to consider that it is in the lung. This CXR shows the NG tube in the left lung. When checking CXRs with a pacemaker, follow the pacer wires from beginning to end to identify lead fracture. You have to look at the leads like you check ribs for fractures. You have to run your eyes over the entire wire. Remember that infection and cancer/leukemia are possible in all these age groups. Any visible posterior fat pad sign on the lateral elbow film is abnormal. A large anterior fat pad sign is also abnormal. If you see a posterior fat pad sign in a child think supracondylar fracture. A visible posterior fat pad sign in an adult is associated with radial head fracture. The S sign if normal is smooth with no step-off or sharp turns. An abnormal S sign has either a step off or an abrupt turn or buckle. A heterogeneous group of 20 orthopedic surgeons, radiologists, and pediatricians viewed 35 radiographs of SCFE using Klein's line on the AP view and the S-sign on frog-leg lateral view to make the diagnosis. They found the overall diagnostic accuracy was better with the S-sign than Klein's line, 92% vs 79%. Sensitivity of the S-sign was 89%, specificity 95%. Sensitivity of Klein's line was 68%, specificity 89%. Combined S-sign + Klein's line sensitivity was 96%, specificity 85%. Take a look and review Klein's line for the AP view and the new S-sign for the frog-leg lateral. Case 1. 47 yo male presents with abdominal pain and hematemesis. Patient has history of ETOHism. On exam, patient was hypotensive and vomiting large volumes of blood. Diagnosis was life-threatening variceal bleeding. Management included crystalloid and blood product resuscitation. Intubation. octreotide, PPI, reverse coagulopathy, antibiotics, and blakemore tube. GI consult and emergent endoscopy were all also indicated. Consider vasopressin. If endoscopy is not successful, consider IR for TIPS procedure. Case 2. 62yo male patient with altered mental status. BP=85/62. Heart rate 46. Patient had history of thyroidectomy and clinical picture of hypothyroidism. Diagnosis was myxedema coma with hypoglycemia, hypothermia, and bradycardia. . Patient was intubated and paced. Patient was given IV dextrose, IV Synthroid, and IV hydrocortisone. Beware of massive tongue in patients with myxedema coma. It may make intubation more difficult. Case 3. 27 yo female involved in a motorcycle crash. BP=165/105 P=105. Patient injured her wrist. X-ray shows perilunate dislocation. You can attempt reduction in the ED using finger traps. Most of these patients need surgery. Perilunate dislocation. Note overlapping bones on AP view. On lateral view the capitate is posterior to the lunate and the lunate is in line with the radius. Perilunate dislocation highlighted on lateral view of wrist.. Note the capitate is posterior to the lunate and the lunate is still in line with the distal radius. Thanks to Dr. Lovell for writing the notes for this lecture! FiO2: start high, titrate down ASAP! Remember, tension pneumothorax and breath stacking represent same end-pathophysiology (obstructive). Use US if you have time, otherwise needle the chest bilaterally if patient coding. There are numerous causes of ST elevation other than STEMI. Pictured are Cerebral T waves which can be seen in subarachnoid hemorrhage. Subarachnoid hemorrhage can cause changes on the EKG such as deep t wave inversions or ST elevation. Inverted, wide T waves are most notable in precordial leads (can be seen in any lead). These are associated with acute cerebral disease, most notably an ischemic cerebrovascular event or subarachnoid hemorrhage. They may be accompanied by ST segment changes, U waves, and/or any rhythm abnormality. Differential diagnosis includes extensive myocardial ischemia. Catecholamine surge seems to be the pathophysiologic pathway of Takotsubo Cardiomyopathy. The LV apex is most sensitive to catecholamines. Takotsubo’s causes apical ballooning in response to a catecholamine surge. Dr. Lovell comment: Pay attention to the details of managing the post-resuscitated cardiac arrest patient. Protect the airway. Avoid hyper/hypo-oxia and hyper/hypo-ventilation. Provide Targeted Temperature Management. Correct hypotension. Provide ASA and Heparin. Identify STEMI and discuss with cardiologist consideration of Cath lab. ACC Risk Stratification Algorithm for Comatose Post-Cardiac Arrest Patients. Patients with multiple unfavorable characteristics are less likely to benefit from emergent cardiac cath. Beware the Hyperacute T wave in the setting of chest pain. Hyperacute T waves may not always have ST elevation. The real key is the T wave’s size in relation to the QRS complex. This EKG was from a patient who went on to develop ST elevation and V-fib arrest. If you are suspicious of hyperacute T waves, get frequent repeat EKG’s to identify ST elevation or other evolution. Reasons to do research: Curiosity, Change the World, Change clinical care, Develop a device or drug, and Career advancement. Dr. Dodd reviewed all the research opportunities available in our department. You will used the phased array probe (cardiac probe) and the linear probe to get your views. This is the order of images in the RUSH exam following the HI MAP mnemonic. You can add in suprapubic views looking for signs of ectopic pregnancy(pelvic fluid) and images of bilat femoral veins to screen for DVT. TEE has been shown to alter the resuscitation management of the cardiac arrest patient. TEE can improve the performance of CPR by identifying where chest compressions are impacting the heart. TEE will frequently give the resuscitationist information to improve the location of chest compressions on the chest. Without TEE info CPR may be only compressing the SVC or RV and not the LV. TEE can also identify pericardial tamponade, valvular dysfunction, V-fib, and cardiac rupture. Rapid Oxygen Desaturation. This is due to patients with high BMI having smaller lung volumes and lower functional residual capacity. Patients with high BMI also have a higher metabolic rate and are using oxygen more rapidly. Because of these factors they desaturate much more quickly. Your safe apnea time is about 75% less than a patient with normal BMI. You need to counter this problem by obsessive pre-oxygenation using 15L Nasal cannula and Flush Rate O2 via a NRB mask or BVM or Bipap. Have the patient’s head up as much as possible during pre-oxygenation. One option to pre-oxygenate. Other options are NRB with wall O2 open to Flush Rate. Bipap is another excellent option if you have time and the patient can tolerate. 2. More difficult airway management. This is due to larger tongue, more redundant tissue in the airway, thicker/less mobile neck. Patients have a smaller airway making visualization and intubation more difficult. Counter this problem with careful positioning. Elevate the head of the bed 25 degrees and put the patient in the sniffing position by elevating the head so the external ear canal is anterior to the sternum. A is not good positioning. B and C both have the ear canal anterior to the sternum which will optimize your glotic view. 3. More difficult rescue of the failed airway. It is more difficult to BVM patients with high BMI. LMA is the preferred rescue device but airway pressures may cause the seal to fail. Finally cricothyrotomy is more difficult. You can counter this problem by planning your rescue prior to sedating the patient. Have an LMA at the bedside. Have a BVM with a Peep valve ready to go. Have an oral airway to facilitate bagging. Consider using ultrasound to identify where the cricothyroid membrane is and mark on the neck it’s location so if you have to perform a cric, you know exactly where to go. Faculty members present felt that RSI after careful pre-oxygenation and positioning was still the best way to optimize your first pass success in the morbidly obese patient. Remember though that if you have significant concerns about how difficult the airway may be, you can always opt for topical anesthetic of the airway and ketamine sedation to avoid RSI. The safest initial therapy for symptomatic sucking chest wounds is the careful application of a petrolatum gauze–based dressing taped on three sides (Figure 53-4). Apply three or four layers of petrolatum gauze over the wound. The dressing should extend 6 to 8 cm beyond the margins of the wound so that it will not be sucked into the pleural cavity in the spontaneously breathing patient. Cover the petrolatum gauze with dry 4 × 4 gauze squares. Apply tincture of benzoin around three sides of the dressing. Apply tape to secure the three sides of the dressing to the chest wall. (Reichman’s EM Procedures 3rd Ed.) Editor’s note: Similar to the above picture, I would think that one of those pink defib conduction pads that you use for the hand-held defibrillator taped on three sides would work as well. Small (<20%) pneumothoraces don’t necessarily need a chest tube. You can put the patient on supplemental oxygen and check another CXR in 6 hours. If it has improved, the patient can be discharged home. Whether a normal chest radiograph excludes an aortic injury is a matter of controversy. One careful review of radiographs in patients with aortic injury did not find any normal radiographs. However, this study excluded technically suboptimal radiographs, was conducted by expert trauma radiologists, and the radiographic findings were subtle (Figures 14 and 15) (White et al. 1994). In two large clinical series, 5–7% of aortic injury cases had radiographs that were interpreted as negative for aortic injury (Fabian et al. 1997, Hunt et. al. 1996). However, the quality of the radiographic technique in these cases was not mentioned, and the radiographic criteria used to assess aortic injury were not stated. Several other case series also report normal mediastinal appearance in patients with aortic injury (Exadaktylos et al. 2001, Woodring 1990). Only when a chest radiograph is of sufficient quality to clearly determine that the mediastinal contours are normal could it be considered adequate to exclude a mediastinal hematoma (Mirvis 2006). However, in one study, 10% of aortic injury cases do not have a mediastinal hematoma on CT and so even a normal, technically optimal chest radiograph should not be used alone to exclude aortic injury (Cleverley et al. 2002). Although of limited value in excluding aortic injury, the chest radiographic signs of mediastinal blood should be recognized and, when present, should prompt a rapid definitive investigation for aortic injury. Definite signs of hemomediastinum in a patient with aortic injury. The mediastinum is widened and the aortic knob is distorted by surrounding blood (arrow). Mediastinal blood causes widening of the right paratracheal stripe (white arrowheads) and displacement of the left paraspinal line (black arrowheads), which extends up to the aortic knob. Calcified lung nodules are almost always benign. Cavitary lesions can be lung cancer, metastasis, abscess, TB, Fungal or Wegener’s. Opacities are bright areas on CXR. Lucencies are dark areas on CXR. Infiltrates is a term that is not well-defined and Dr. Allam advised us to avoid that term. The causes of opacities on CXR include pus (pneumonia), blood, or water. Lingular pneumonia. If the left heart border is obscured, it is due to lingular pneumonia. If the left diaphragm is obscured it is due to left lower lobe pneumonia or atelectasis. Honeycombing pattern c/w Pulmonary Fibrosis. Interstitial pulmonary fibrosis (IPF), also called Usual Interstitial Pneumonitis, results in a restrictive lung disease that diminishes lung compliance and restricts diffusion of oxygen across the tissue to the blood. Over time, the disease leads to impaired exercise tolerance, chronic hypoxia, and cough. Treatment is aimed at immunomodulation through steroids and cytotoxic agents to halt disease. While late IPF is easily identified on chest radiographs, early disease is difficult to distinguish from other interstitial processes, such as CHF. Pulmonary fibrosis has a classic appearance of interstitial markings more prominent at the bases. Deep sulcus sign indicative of pneumothorax in supine patients. The air accumulates inferiorly rather than superiorly as it would in an upright patient. An admission electrocardiogram (ECG) should be performed on all patients in whom BCI is suspected (no change). If the admission ECG reveals a new abnormality (arrhythmia, ST changes, ischemia, heart block, and unexplained ST changes), the patient should be admitted for continuous ECG monitoring. For patients with preexisting abnormalities, comparison should be made to a previous ECG to determine need for monitoring (updated). In patients with a normal ECG result and normal troponin I level, BCI is ruled out. The optimal timing of these measurements, however, has yet to be determined. Conversely, patients with normal ECG results but elevated troponin I level should be admitted to a monitored setting (new). For patients with hemodynamic instability or persistent new arrhythmia, an echocardiogram should be obtained. If an optimal transthoracic echocardiogram cannot be performed, the patient should have a transesophageal echocardiogram (updated). The presence of a sternal fracture alone does not predict the presence of BCI and thus should not prompt monitoring in the setting of normal ECG result and troponin I level (moved from Level 3). Creatinine phosphokinase with isoenzyme analysis should not be performed because it is not useful in predicting which patients have or will have complications related to BCI (modified and moved from Level 3). Nuclear medicine studies add little when compared with echocardiography and should not be routinely performed (no change). Trauma attending comment: Not recommended to get a troponin unless there is a new EKG abnormality, arrhythmia, or hemodynamic changes. Editors comment: This is a controversial topic. I think many clinicians would consider getting a troponin in a patient with concern for possible blunt cardiac injury. Trauma Attending comment: Treat hemothorax with a 32-36F chest tube. Indications for going to the OR is 1500ml of blood out immediately or 250ml/hr for four hours. High flow nasal cannula O2 may benefit patients with flail chest by providing some level of Peep. Bipap can also be used to support alert, cooperative flail chest patients. Trauma Attending comment: It should be very rare for an emergency physician to perform an emergency thoracotomy. There are many risks to the patient and the physician when performing this procedure. Harwood comment: Never do an emergency thoracotomy for blunt trauma or GSW to the chest, or non-chest trauma. But if there is an isolated stab wound to the region of the heart and patient has signs of life that may be the one time to go for it. Trauma Attending comment: If you do open the chest and find a pericardial tamponade. Be very careful opening the pericardium to avoid cutting the phrenic nerve. Repair the ventricular injury with stables rather than sutures or foley balloon tamponade. Sutures are difficult to place in the heart and a foley balloon tends to tear through the hole making it larger. Patients with aortic injuries that survive to the hospital get delayed repair. The Trauma surgeons fix all the other injuries first then a day or two later do an endovascular repair. Case 1. 65 yo male presents with difficulty breathing. The patient is tachycardic and tachypneic. Patient has history of COPD. Patient has had worsening cough over last few days. Patient also had left sided chest pain. Patient has valid DNR/DNI order. CXR shows a left sided pneumothorax. Patient was treated with a chest tube and standard therapy for COPD. COPD is the most common risk factor for pneumothorax. Usually pneumothoraces in COPDr’s are due to apical blebs that rupture. Dr. Lovell comment: Be cautious not to diagnose an intact bleb as a pneumothorax. You could inadvertently place a chest tube into an intact bleb and cause a pneumothorax. You may need a CT to differentiate pneumothorax from a bleb. Case 2. 32 yo female with hip and pelvic pain due to an MVC. Patient is tachycardic and hypotensive. Patient had an open book pelvic fracture. Pelvic binder applied. Crystalloid infused and Massive transfusion protocol activated. Transfuse in a 1:1:1 ratio of prbcs, platelets, and plasma. Pelvic ring fractures have the highest risk of hemorrhage. After intra-abdominal hemorrhage has been ruled out, IR should be utilized to stabilize patients with hemorrhage from pelvic fracture. IR stops arterial hemorrhage related to pelvic fracture but not venous hemorrhage. Case 3. 43yo male presents with bleeding gums and oral pain. Patient is febrile. Treat with Augmentin,clindamycin or doxycycline and chlorhexidine rinses. Hypokalemia is the most dangerous electrolyte abnormality when treating DKA. Start repleting K with a K < 5.3. If K<3.5, don’t give insulin until you have started KCL infusion. Anti-seizure medications, steroids, neuroleptics, ASA, betablockers, and calcium channel blockers can all affect glycemic control. When treating DKA in kids, if they become altered, think cerebral edema. If iatrogenic hypoglycemia has been ruled out, start mannitol even prior to CT. Patients with adrenal crisis will have hypotension, hypoglycemia, hyponatremia/hyperkalemia, weakness and diarrhea. Dexamethasone is the only steroid that does not interfere with the cortisol assay or cosyntropin test. Thyrotoxicosis is a hypercoaguable state. So have your guard up for PE in patients with thyrotoxicosis and hypoxia. To optimize patient safety, consider every female ED patient pregnant until proven otherwise. Next approach every pregnant ED patient as if they have an ectopic pregnancy until proven otherwise. The most common site of ectopic pregnancy is the ampulla. Ectopic pregnancy is the leading cuase of first trimester maternal death. Emergency physicians should be extremely cautious about ordering methotrexate to treat ectopic pregnancy. You need to have very careful consultation with OB-Gyne consultant prior to administration. It may be preferable to defer entirely to OB-Gyne specialist. Harwood comment: The failure rate of methotrexate is 14% with rupture. In the setting of a pelvic ultrasound showing no IUP, the new ACOG Guideline recommends not diagnosing ectopic pregnancy until the level of quantitative beta-hcg is above 3000. Spontaneous abortion: Estimated 20% of pregnancies terminate in abortion. One-half occur before 8 weeks’ gestation and one-fourth before 16 weeks’ gestation. Many go unnoticed and unrecognized. This is a common cause for visit to the emergency department. Complete abortion: Fetal demise and all products of conception are spontaneously expulsed. Missed abortion: Fetal demise and failed expulsion of the products of conception from the uterus, with a closed cervix. If the condition lasts longer than 4-6 weeks, the patient is increased risk for infection and DIC. Incomplete abortion: Incomplete expulsion of the products of conception. There is retained products of conception. The cervix is open. Harwood comment: There is no real role for 50microgram dosing of RH negative pregnant patients in the ED with vaginal bleeding or trauma. Give all RH negative patients with an indication for rhogam 300 micrograms. Unfortunately I missed a large portion of this outstanding lecture. Is there such a thing as biphasic anaphylaxis? This was a retrospective review of 83 patients at a single center with severe anaphylaxis, requiring ICU admission. Of these, 99% received antihistamines, 90% steroids, and just 80% epinephrine. One patient out of 83 (1.2%) had probable biphasic allergic reaction, and this was merely skin changes, not life-threatening and not anaphylactic, according to the study definition. Of the 3 possible and 1 probable biphasic allergic reactions, they occurred at an average of 14 hours from the initial reaction. This study had some issues. The most important is that of patients with severe anaphylaxis, 20% didn’t receive the most important therapy - epinephrine. So, even with suboptimal treatment, the incidence of biphasic allergic reaction within 72 hours was very low and the single probable reaction was mild. Another issue is the retrospective nature was limited in determining what was and was not an allergic reaction, such as rash or hypotension for other reason, such as sepsis. My take home point is that true biphasic anaphylactic reaction is rare or non-existent. Most patients simply need to be observed a few hours to ensure they don’t have persistent anaphylaxis, especially those with ingestion of a food as the cause of the reaction. 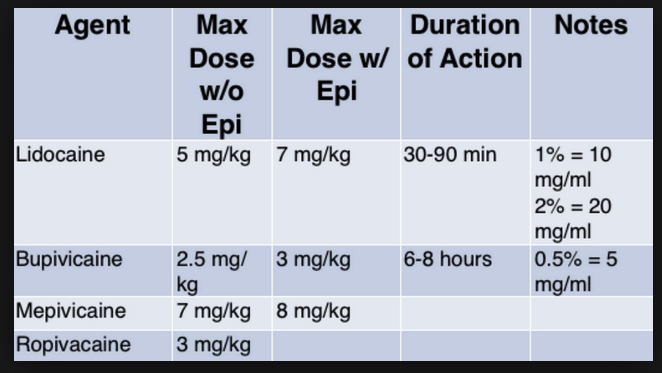 The Skeptics Guide to EM did an in-depth, outstanding summary of biphasic anaphylaxis. Their bottom line: “Prolonged observation is likely unnecessary,” once symptoms resolve in the ED. Don’t miss this post. Indications for emergent esophageal FB removal are complete obstruction, battery in the esophagus, and sharp object in esophagus. Diagnosis is clinical and treatment is supportive. Salivary gland swelling typically lasts from 1 to 5 days. The patient is contagious for 9 days after the onset of parotid swelling, and children with mumps should be excluded from school or day care for this interval. Some tips: the carotid is posterior-lateral to the tonsil, so keep your needle directed posteriorly and medial to the molars. The cavitary U/S probe can be very helpful to localize the abscess. Using an 18 gauge 3 cm spinal needle is useful because compared to a standard 18g needle, the longer needle keeps the syringe at or distal to the patient’s teeth. This improves visibility of the peritonsillar area, gives an increased range of movement, and has more utility in the setting of trismus. You have to use an 18g needle to be able to aspirate pus. Smaller needles may not be able to aspirate pus. You can get good exposure by having the patient use a laryngoscope or lighted disposable vaginal speculum to hold down their own tongue. Trim the needle cap and place it over the needle to act as a depth gauge (Figure 175-5A). The needle should project only 1 cm from the distal end of the needle cap. Alternatively, apply a piece of tape onto the needle to mark a point 1 cm from the tip of the needle (Figure 175-5B). The guard (cap or tape) serves as a marker for the maximum allowable depth to insert the needle during the procedure. Limiting of the depth of insertion of the needle will prevent injury to the carotid artery that is located approximately 1.5 to 2 cm posterior and lateral to the tonsil. Our awesome EM Intensivists taught us how to optimally place a central line. I can’t do justice to all the teaching they did but here are just a few fine points I picked up. When putting your sterile gown on by yourself, Velcro the neck first before you put your arms through the sleeves. The plastic adhesive strips in the sterile probe cover package can be used to tape the probe cord to the drape so the probe doesn’t fall off the patient. Line up bevel of needle with the numbers on the barrel of the syringe so you know where the bevel is. When you are locating the IJ in the neck, keeping the probe pointed at the floor instead of aiming it toward the neck will help keep the orientation of the IJ and IC more true. Once you have punctured the skin, move the ultrasound probe with your needle so that you always have the tip in view and can visualize exactly where you enter the vessel. When making the cut with a scapel put the blunt side of the scapel towards the wire. 45 yo male presents with altered mental status. Patient was reported to be intoxicated and vomiting. In ED patient was found to have head laceration and rash. He was hypotensive and tachycardic. Patient was in detox recently and was on multiple medications including antabuse. DDX=disulfiram reaction, ETOH intoxication, serotonin syndrome, ICH, toxic ingestion, dehydration, sepsis, anaphylaxis. Patient had improving blood pressure and rash with IV fluids. Mental status worsened with a GCS of 7-8. Patient is next intubated. Disulfiram reactions can result in tachycardia, hypotension and cardiovascular collapse. Other tha ETOH, disulfiram reactions can also be caused by chlorpropamide, flagyl and griseofulvin. The duration of the disulfiram-alcohol reaction varies from 30 to 60 minutes in mild cases to several hours and is largely dependent on the amount of alcohol that needs to be metabolized. Due to vomiting and volume depletion, serum glucose, electrolytes, and kidney function should be evaluated. Since only small amounts of ethanol can precipitate a disulfiram–ethanol reaction, it may be useful to confirm the presence of ethanol with a blood concentration. Patients with cardiovascular instability should have an ECG. Symptomatic and supportive care is the mainstay of treatment. 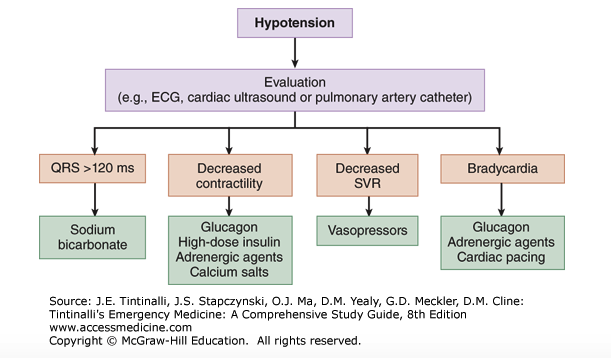 Most patients with hypotension respond to intravenous 0.9% sodium chloride. Refractory hypotension is rare, but if necessary, a vasopressor can be administered. A direct-acting adrenergic agonist such as norepinephrine should be used since disulfiram inhibits dopamine β-hydroxylase (DBH), an enzyme necessary for norepinephrine synthesis. As such, indirect vasopressors, such as dopamine, that require functioning norepinephrine synthesis may be less effective. For further symptomatic care, antiemetics can be administered, and for cutaneous flushing, a histamine (H1) receptor antagonist, such as diphenhydramine, can be given.101 Most patients with a disulfiram–ethanol reaction have mild symptoms, are hemodynamically stable, and can be safely discharged following resolution of symptoms. Hallucinogenic compounds all have similar chemical structure. Hallucinogenic botanicals include morning glory and Hawaiian baby woodrose. Magic Mushrooms are a source of psilocybin. Ayahuasca and the Yakee plant are plants in the amazon that contain the compound N,NDMT a potent short-acting hallucinogen. Toad licking can cause hallucinogenic effect. (Colorado toad). Toad licking also can cause arrythmias. Peyote and mescaline are other hallucinogens. Some cacti available on line contain peyote or mescaline. Salvia is from the mint family and can be purchased on the internet or at a garden store. The leaves contain hallucinogens. Most hallucinogens affect the serotonin receptors. There may also be sympathomimetic effects. Hallucinogens are not routinely identified on urine toxicology screens. Treat hallucinogenic overdoses with benzodiazepines, cooling, and quiet environment. Ackee fruit from Jamaica can cause hypoglycemia. Sulfonylurea medications increase insulin secretion from pancreatic beta cells. Metformin inhibits gluconeogenesis, enhances glucose transport into muscles. Decreases glucose being released from liver. Mild changes in renal function or a new drug interaction can be causes of new onset hypoglycemia. A single large injection of insulin is more dangerous than multiple smaller doses because a large dose creates a “depot effect”. The “depot effect” will result in prolonged release of insulin. Insulinoma and sulfonylureas will result in elevated c-peptide levels. Synthetic insulin does not have c-peptide. In the hypotensive trauma patient, consider hemorrhage as #1 cause. After hemorrhage, consider obstructive causes of shock (tamponade or tension pneumothorax). When exposing the patient make sure you examine the whole body back and front looking for subtle injuries. At the same time consider environmental exposures such as acids, bioterrorism agents, or radioactive contamination. After fully exposing the patient, keep patient warm with blankets and heat to avoid hypothermia. The GCS is a critical means of communicating the neurologic status of the patient between caregivers as well as a way to monitor the patient’ neurologic status. Key ED goal for head trauma management is to avoid hypotension and hypoxia. Elevate the head of the bed. Mannitol or hypertonic saline may be used to lower ICP. Avoid mannitol in patients with renal failure. Avoid hypertonic saline in patients with CHF. Basilar skull fracture=temporal bone fracture. Subdural hematomas have significant underlying brain injury. The blood collection can cross suture lines. It is venous bleeding from bridging veins. Traumatic subarachnoid hemorrhages as opposed to aneurysmal subarachnoid hemorrhage are more peripherally located. Traumatic intraparenchymal hemorrhages are often in frontal or temporal lobes. DAI has a benign appearing CT head/MRI with a severely affected GCS/mental status exam. Some DAI patients will improve significantly within a year or so. Prognosis is difficult to predict. Patients with head injury have 50% increased mortality with single episode of hypotension. Do not use therapeutic hypothermia in traumatic head injury. Recent RCT showed no benefit and trauma surgeons emphasized that hypothermia increases traumatic bleeding. When intubating patients with significant head injury and you don’t have to do a crash or life-saving emergent intubation, be very careful to avoid any desaturation or hypotension during the intubation. Unfortunately I missed a significant portion of this outstanding lecture. Be very cautious giving IV beta blockers to patients with decreased cardiac function. Patients with diminished cardiac function can deteriorate with IV beta blockers. Determining a patient’s cardiac function can be challenging in the acute setting. Consider checking a bedside echo prior to giving a rate control agent. Start with a low dose and re-evaluate closely. During the discussion of this clinical situation, the Cardiologist at the meeting voiced a contrarian view and felt this was an overly cautious approach and that most patients can tolerate reasonable doses of rate control agents. Tekwani comment: Get an ABG or VBG early on to see the lactate. It may clue you in to a hypoperfused state or cardiogenic shock. Harwood comment: A VBG also gets you a rapid potassium level. Cardiology comments: We try to avoid cath in patients with coronary artery dissection because cath can propagate the dissection. Most patients are treated with anticoagulation. I f a patient has a new right bundle branch block and left anterior fasicular block, be concerned for a proximal LAD occlusion and need for a pacemaker. Post-partum patients who develop coronary artery dissection should be counselled to not have further pregnancies. Cardiac surgery can be helpful at times to manage SCAD. There was consensus among the cardiologists that managing coronary artery dissections is very treacherous and cardiac cath is not a slam dunk. If you have a post-partum patient presenting to the ED with a STEMI you should activate the cath lab but discuss with the cardiologist the possibility of SCAD. If you have concerns for ACS get repeat EKG’s every 10 minutes or so to try to pick up a STEMI. Inferior STEMI’s can initially have subtle inferior ST elevation, so be alert to ST depression in leads 1 and AVL which can be more eye catching. If Lead 3 is elevated more than Lead 2 or AVF it suggests right coronary involvement. Avoid Nitro in a patient with a normal BP and concern for right coronary infarct. Case 1. 19yo female with chest pain for 2 days. Patient is tachycardic. Patient had been forcefully vomiting in the days prior to presentation. Diagnosis was Boerhaave’s syndrome. Patient required IV antibiotics and Thoracic surgery consultation. Case 2. 11 yo male with behavior changes. Vitals are normal. Patient had recent sore throat with incomplete antibiotic therapy. Patient recently moved from Saudi Arabia. Patient had choreiform movements and emotional lability. Diagnosis was Sydenham’s Chorea and Acute Rheumatic Fever. Treatment is 500mg of PCN BID chronically. Case 3. 64 yo female with facial weakness. Patient has DM and HTN. Exam also identified vesicles on the external ear and ear canal. 3 indications to Intubate: Protect airway, Can’t oxygenate or ventilate, Anticipated clinical course. The LEMON mnemonic is a well accepted algorithm for the initial evaluation of the airway and predicting a difficult airway. It is not 100% sensitive for identifying a difficult airway. If you foresee a difficult airway, call for help. Ask Anesthesia or the MICU Intensivist to come down to back you up. If you have a failed airway where basically you can’t intubate, place a LMA and proceed to cricothyrotomy. Pre-oxygenate with NRB mask with O2 at “flush rate” for at least 3 minutes or use BIPAP. Preoxygenate the patient sitting up if possible to optimize pulmonary function. Also use apneic oxygenation at 15L NC in addition to your NRB or BIPAP. Dr. Patel comment: You can use HI FLOW nasal cannula O2 for apneic oxygenation. When intubating, start bagging the patient as soon as their O2 sat drops to the 95% range. Case 1. If an asthmatic has a PCO2 of 42 or higher you need to be thinking they are fatiguing. You need to escalate care and be prepared for intubation. After intubating an asthmatic patient set your vent to a Tidal volume of 6 ml/kg. Set ventilation rate at 12. Set O2 sat at 100% initially then titrate down to 40% quickly if possible. Set Peep at 0-5. I:E 1:5. High inspiratory flow rate 80-100 liter per minute. You will have to tolerate an elevated PCO2 so you don’t run into breath stacking, elevated peak and plateau pressures, or barotrauma. ACE-I are the #1 cause of angioedema. Calcium channel blockers are the #2 cause of angioedema. When giving ketamine for induction of a patient with a presumed difficult airway give 2mg/kg but give it slowly over a few minutes. If you give this dose rapidly, you can cause apnea. Antidote=Anything that improves survival from a toxin. When calculating the Osmoles for a boards question you can simplify the equation by rounding 18 to 20, 2.8 to 3 and 4.6 to 5. You will get close enough to the right calculation. Ethylene glycol and methanol will increase the anion gap. The antidote for ethylene glycol poisoning is fomepizole. The antidotes for severe lead poisoning are BAL and EDTA. Oral succimer can also be used for mild cases or if you can’t use BAL due to peanut allergy. Editor note: mnemonic for BAL-EDTA is LED. BAL ends with L and EDTA starts with ED. The antidote for Gyromitra mushroom poisoning is B6 (pyridoxine). Patients can seize from Gyromitra poisoning. B6 is also used for seizures due to INH poisoning. The antidote for TCA cardiac toxicity is NA-Bicarb. If you see this EKG in the setting of an overdose, think TCA and give a trial of NABicarb. If it works, it will narrow the QRS complex and narrow the terminal R wave of AVR. A Wide R wave in AVR and wide QRS complexes generally are clues on the EKG to a TCA overdose. The antidote for calcium channel blocker overdose is Insulin at 0.5 U/kg bolus followed by 0.5U/kg/hr drip. You can also give calcium gluconate. Calcium gluconate is preferred over Calcium chloride due to less risk of soft tissue damage if the calcium extravasates from the vein. Jimsonweed has anticholinergic effects. The treatment is benzodiazepines. A direct antidote is physostigmine if needed. Antidotes for sulfonylurea overdose are glucose and octreotide. Glucagon may help if there is some glycogen stores remaining. Oleander, foxglove, and lily of the valley are all botanical glycosides and the antidote for them is digibind (FAB fragments). You can also try atropine. The antidote for hydrofluoric acid burn is calcium gluconate. The fluoride burns through tissue and binds calcium. You can give calcium gluconate by making a gel with surgilube, or give subQ injections with a TB syringe or for severe burns give intra-arterial calcium gluconate. Methylene blue is the antidote for methemoglobinemia. Dapsone can cause methemoglobinemia. The antidote for organophosphate poisoning is atropine and 2-PAM. The atropine reverses the muscarinic symptoms, specifically it dries secretions. 2PAM re-activates the acetylcholinesterase to stop the nicotinic effects. The antidote for iron toxicity is deferoxamine. Side note by Dr. Carlson: The antibiotic omnicef is chemically similar to deferoxamine and can give small kids “brick red” poop. This can be concerning for parents. The antidote for carbon monoxide is hyperbaric oxygen. Case 1. 45 yo male presents with fever and shortness of breath. Patient is tachycardic. Patient has history of type 2 diabetes. Exam demonstrates scrotal swelling, erythema, and crepitence. The patient required IV antibiotics (Vanco/Zosyn/Flagyl) and emergent surgical debridement. Dr. Williamson made the point that diabetics with fournier’s gangrene may have sensory neuropathy that diminishes pain perception and may not be aware of an early perineal infection. Fournier's gangrene is a polymicrobial, synergistic, infective necrotizing fasciitis of the perineal, genital, or perianal anatomy. This process typically begins as a benign infection or simple abscess that quickly becomes virulent, especially in an immunocompromised host, and results in microthrombosis of the small subcutaneous vessels, leading to the development of gangrene of the overlying skin. Case 2. 2 yo female patient presents with decreased level of consciousness. Patient is hypotensive and tachycardic. The patient took some of mom’s medications. X-rays show radio-opaque pills. Radio-opaque iron tablets in the stomach. Dr. Wilimson made the point to not do whole bowel irrigation in patients who have GI bleeding or signs of shock. Either a 50mg/kg ingestion of iron or a serum iron level of 500 are indicators of severe toxicity. Even moderately poisoned children require meticulous supportive care to ensure a positive outcome. For patients in shock, large volumes of intravenous fluids and sodium bicarbonate are required to maintain fluid, electrolyte, and acid–base status. Editor’s note: Dr. Carlson disagreed with the use of sodium bicarbonate. She felt sodium bicarb was not indicated for standard management of iron toxicity. Chelation with intravenous deferoxamine is used for significant iron ingestions. Indications are the presence of significant symptoms or signs of iron poisoning, a serum iron concentration greater than 500 μg/dL, or metabolic acidosis. Deferoxamine should be administered at a rate of 15 mg/kg/h. Administration of intravenous deferoxamine to patients with intravascular volume deficits risks nephrotoxicity. It is important to provide a bolus of crystalloid before initiating the deferoxamine infusion. The duration of chelation therapy is variable; there are no reliable end points.7 Serum iron determinations during the course of iron poisoning do not reflect clinical toxicity, and they are often unreliable during deferoxamine therapy. Using a return of urine color to normal is not recommended as an end point for chelation therapy. It has never been validated, and pigmentation of urine (vin rose urine) is concentration and pH dependent. The most useful criterion for continued chelation is the presence of a metabolic acidosis despite satisfactory perfusion. This indicates the presence of non–transferrin-bound iron in the plasma. Deferoxamine is rarely required beyond the initial 24 hours after iron ingestion. Dr. Carlson comment: the TIBC level does not have a role in determining iron toxicity. Case 3. 38 yo male with right arm pain. Patient fell from ladder and injured right arm. Patient has a laceration in area of injury. Xrays showed the injury below. Galeazzi Fracture, fracture of the distal radius with radial-ulnar dislocation. This injury requires surgical management. It’s a big decision to go to New Zealand to do locums. You have to weigh the upsides and downsides for you and your family. Downsides to going: You will make less money (@$100,000) and the cost of living is higher. Taxes are 30% in New Zealand and you also get taxed again in the US for whatever you make over $100,000. You obviously need to move far away. You will be placed in a rural environment because that is where they need the docs. You have to commit for at least a year. Reasons to do this: You get to do something really cool. You get significant time off (6 weeks paid, 10 days paid holiday). You get to practice your craft in a different environment. You get to experience a different healthcare system and a different way of life. The work: EM is a relatively young specialty in NZ. Because of that, consultants like anesthetists and pediatricians frequently get involved in your cases. NZ has a national formulary so medications are affordible for patients. Malpractice risk is quite low. No night shifts for attendings! There are no respiratory therapists. Hemodialysis is rare. The pain control culture is very different. Patients want very little pain medication. There is much less imaging than in the US. Getting a CT is kind of a big deal. Top 3 causes of death in Dominican Republic: Ischemic heart disease, stroke, road injury. Our residents and faculty took part in this global Health experience through a faith-based clinic and surgery center (Institute for Latin American Concern) affiliated with Creighton Medical School and Advocate. Visiting health professionals taking part in this global health experience live with local families near the clinic. Drs. Hawkins and Pastore took back the awesome experience of living and practicing medicine in another country and a gratitude for what we have here in the US. AMA myths debunked: Insurance does cover AMA dispo’s. You can give prescriptions to patients signing out AMA. You as the physician can explore with the patient what factors are pushing them toward leaving AMA. Sometimes you may be able to address their concerns so they can stay. AMA discussions do not need to be confrontational. You will be better served if you can be supportive and collaborative with the patient. Maybe think about it as managing/optimizing the AMA process instead of having a conflict with the patient. Patients who have decisional capacity can not be kept against their will unless they are suicidal, homicidal, or psychotic. The level of lipase elevation does not correlate with severity of pancreatitis. CT imaging is not required for most cases of pancreatitis. Treat pancreatitis with aggressive LR administration. Give 1-2 liters as a bolus then continue with a rate of 150-200ml/hour. Mild pancreatitis does not have organ dysfunction. If a patient has SIRS or organ dysfunction they have moderate or severe pancreatitis. The three most common organ dysfunctions associated with pancreatitis are renal, cardiovascular, and pulmonary. Sonographic Murphy’s sign is 97% specific. So if the patient has tenderness with the probe over a gallbladder with stones, they have cholecystitis. Choledocolithiasis and Cholangitis both need GI and Gen Surg on consult. Patients with cholangitis also need IR to get source control by placing a percutaneous drain. Healthcare Disparity= Difference in access to care and quality of healthcare between groups. 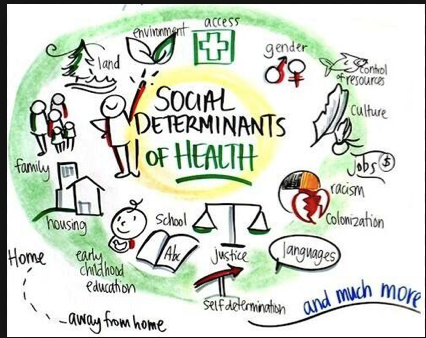 Social determinants of health include many things outside of the healthcare system such as housing, income, racism, pollution, social and family support, the legal system, etc. Consider the social differential diagnosis for different complaints. Lack of access, need to provide childcare, poverty, side effects of medications, can’t miss work, need to serve as a care giver to another person, prison, and homelessness are just some examples. ED Care Managers can work through the social differential and figure out how to support a patient to improve their overall health and be able to be compliant with the treatment plan. Care Managers can arrange disposition from the ED to a SNF. They can arrange financial assistance. They can set up follow up appointments. No case details, just a few take home points. If a patient has signs of cardiac strain from PE or has other high risk factors (PESI score), consider admitting patient to the ICU or Step-down rather than the floor. The reported sensitivity and specificity of CT in demonstrating right heart dysfunction are around 81% and 47% respectively 5. 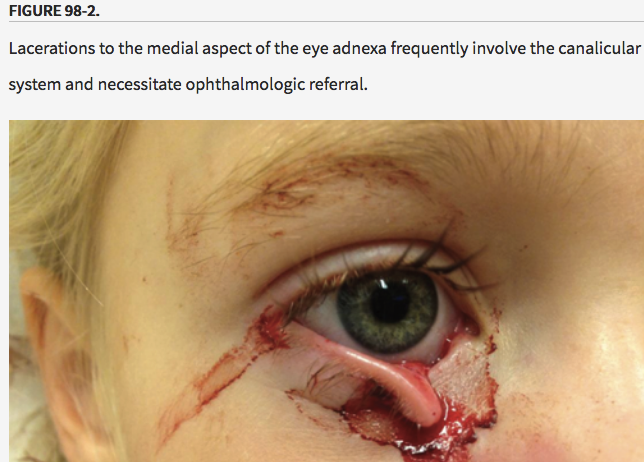 Don’t try to close lacerations near the medial canthus on either the upper or lower eyelids. There can be an injury to the tear duct. Consult Ophthalmology. Patients with posttraumatic iritis usually present 1 to 2 days after blunt trauma to the eye, complaining of photophobia, pain, and tearing. They often have marked blepharospasm and perilimbal injection (ciliary flush). Test for pain on accommodation by having the patient first look across the room at a distant object and then quickly focus on the examiner’s finger held several inches away. If near gaze causes pain, there is a high probability of iritis. The pupil may be large or small. Posttraumatic miosis develops secondary to spasm of the pupillary sphincter muscle, whereas posttraumatic mydriasis results when sphincter fibers are ruptured. Slit lamp examination will usually reveal cells in the anterior chamber, the hallmark of iritis. Treat with a long-acting topical cycloplegic, such as 5% homatropine, four times a day for 1 week, oral anti-inflammatory medication, and dark sunglasses to decrease pain. Symptoms may persist for up to 1 week. Although ocular steroids decrease inflammation, prescribe them only after consultation with the ophthalmologist who will see the patient in follow-up. If HSV involves the deeper layers of the cornea, you can also see a disciform HSV keratitis. Malignant otitis externa can be seen in diabetic patients. The most common complication is paralysis of the 7th cranial nerve. Case 1. 61yo female brought in by EMS with “stroke” symptoms. Dexi=155. Patient is altered and has slurred speech. Last time patient was normal is unclear. On further history, patient states she has been dizzy for a week. Patient is on phenytoin for seizures. Her phenytoin level is markedly elevated to 63. Treatment of phenytoin toxicity is supportive. Very severe toxicity may benefit from dialysis. Central Cord Syndrome is the most common spinal cord syndrome. It is seen most commonly in elderly patients with hyper-extension cervical spine injuries. The patient required C-spine stabilization and Neurosurgery consultation. Steroids are no longer recommended for central cord syndrome. Case 3. 18yo male with right wrist injury from playing football. Distal Radial-Ulnar Joint (DRUJ) dislocation should be suspected with any widening of the space between the distal radius and ulna. The lateral view shows to distal ulna displaced posterior to the radius. Treatment is closed reduction, splinting the wrist, and orthopedic follow up. In some cases surgery is required. 3 cases were presented. Each patient returned to the ED with a change in clinical picture. If the patient has an unclear diagnosis (belly pain, vague neurologic symptoms, back pain) and you are discharging them home, be sure to give clear discharge instructions describing signs/symptoms that should prompt return to the ED. Dr. Williamson comment: These cases demonstrate the importance of communication with the patient. You want the patient to feel totally comfortable about returning to the ED for further evaluation. Dr. Ryan comment: I tell the patient, “if your pain is getting worse, or you get a fever, or some new problem develops, that should not be happening. If it does happen, that is a sign that something is wrong and you need to come back to the ER.” Also give patients a time frame on when they should be feeling better. If they are not feeling better by then, they need to return for further evaluation. Choosing the appropriate level of inpatient care for a specific patient (Floor, Telemetry, Step Down, or ICU) can be challenging. Examples of diagnoses suitable for telemetry: Stable NSTEMI, syncope presumed to be cardiac, arrhythmia/heart blocks, pacemaker or ICD problem. Examples of Patients suitable for Step-Down: Patient on a single pressor, chronically ventilated patients, patients requiring a high level of nursing care, and patients with significant risk of deterioration. In general, if you are concerned that a patient may deteriorate or decompensate, strongly consider placing them in Step-Down rather than the floor. If the patient is critically ill put them in the ICU. Dennis Ryan comment: Consult with the ICU attending to collaborate on whether a patient belongs in Step-Down or the ICU to better determine level of care. Editor’s comment: Suggested simplified algorithm. Stable patients go to the floor/med-tele/telemetry. If you are worried the patient may deteriorate consider Step-down. Critically ill patients go to ICU. The Chiefs presented multiple clinical pictures for pattern recognition. This outstanding presentation moved too fast for me to capture. No case details just take home points. 10. If you want to be fast in the ED, focus on dispo’s. Make your dispo’s prior to seeing new patients. 9. Be kind to yourself. We have a hard job. Beating yourself up after a less than optimal case is not productive and can be self-destructive. 8. If you feel like something is wrong with a patient, listen to your gut instincts and work them up or re-evaluate them. 7. If your patient is not responding to therapy, you may be missing something. There may be another diagnosis that has not been identified. 6. Stay late for the right things (education, critical patient care) but know when to call it a day. It’s good to put in the effort to learn and care for patients. On the other hand you have to recognize when you are fatigued and not able to be the best for yourself and your patients. 5. Don’t send unstable patients to the CT scanner. 4. You will be in uncomfortable clinical situations at times but know who your backup is. 3. Some patients can be challenging to get along with, but beware, these challenging patients can still be sick with serious disease. 2. Our patients are our responsibility. This includes new patients, signed out patients, difficult patients, all of them. Be sure to take care of your colleagues. We all need each other to do this job. Many OTC products contain salicylate. Oil of wintergreen (methylsalicylate) has very high levels of salicylate. Get serial serum levels of salicylate when managing salicylate overdose patients. Salicyate causes neurostimulation resulting in tinnitus and increased respiratory rate and vomiting. It increases capillary permeability and can cause pulmonary edema. It uncouples oxidative phosphorylation and will result in lactic acidosis. Andrea made the point that if a salicylate toxic patient becomes lethargic or somnolent you’ve got big problems. Lethargy is a sign of brain dsyfunction, which is the main cause of deaths from salicylate. 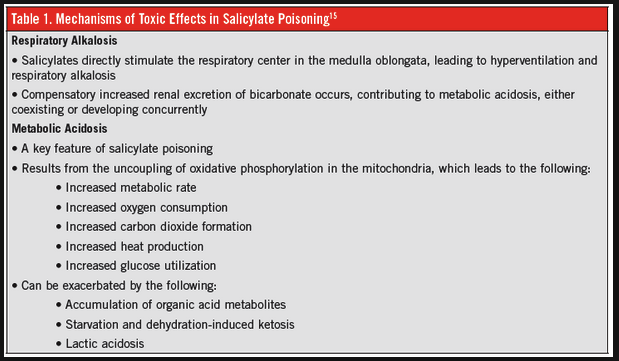 Chronic salicylate toxicity is more lethal than acute poisoning. Chronic poisoning has high brain tissue levels despite modest blood levels. Beware of brain symptoms such as lethargy and somnolence. Andrea made the point that salicylate-toxic patients most often die from a CNS death. Activated charcoal if given very early, before symptoms develop, binds salicylate very well. If a patient is symptomatic it is likely too late to benefit from activated charcoal. Treat non-cardiogenic pulmonary edema with peep. You can try BiPap. You can intubate but it is dangerous because of the acidosis. It is difficult for a ventilator to keep up with the patient’s minute ventilation. If you have to intubate, use larger tidal volumes (around 8ml/kg) and high respiratory rate (40). If you can avoid using a neuromuscular blocker that would be optimal. Give 2 amps of bicarb prior to intubation to help manage the acidosis and possibly avoid a peri-intubation arrest. Urinary Alkalinization: Put 3 amps of bicarb in a 1L bag of D5W and run at 250ml/hr. Add 20-40 meq of potassium to each liter. Shoot for a urine ph >7.5. Case 1. 46yo female presents with suicide attempt. Patient is unresponsive. Pupils are pinpoint. Patient responded to narcan. Further history identified that patient ingested Zohydro (extended release hydrocodone). As ED course progressed, patient became re-sedated requiring re-dosing of narcan and starting a narcan drip. Methadone, fentanyl, tramadol and buprenorphine will not show up positive on drug screen. Case 2. 19yo female presents with nausea/vomiting and abdominal pain. Patient is pregnant. U/S of pelvis shown below. Patients with molar pregnancy may have larger uterus and may have very high beta-hcg. Patients with molar pregnancy are at risk for trophblastic malignancy and need follow up. There is also risk of ovarian torsion. A molar pregnancy is caused by an abnormally fertilized egg. Human cells normally contain 23 pairs of chromosomes. One chromosome in each pair comes from the father, the other from the mother. In a complete molar pregnancy, an empty egg is fertilized by one or two sperm, and all of the genetic material is from the father. In this situation, the chromosomes from the mother's egg are lost or inactivated and the father's chromosomes are duplicated. Case 3. 25 yo male presents with “allergic reaction” for 2 weeks. Vitals normal. Patient has pruritic rash. Toxic megacolon can be seen with either ulcerative colitis or crohn’s disease. Bowel is >6cm in diameter. There is loss of haustra. Crohn’s disease patients can get a stricture at the terminal ileum resulting in bowel obstruction. Pyoderma gangrenosum (PG) is an inflammatory condition of all ages but is most common among 20- to 50-year-old females. Lesions can be located anywhere (most commonly on the lower extremities) and begin as a papulopustule surrounded by erythema. This pustule erodes to form a necrotic ulcer. 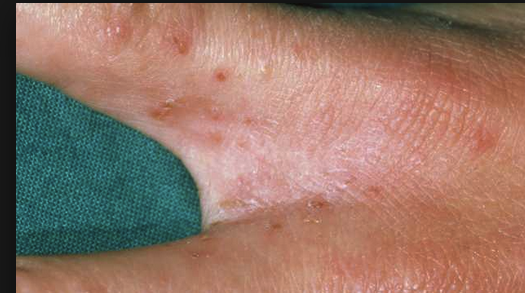 Similar satellite pustules and ulcers form around the original lesion and eventually coalesce into a large ulcer. The surrounding border is “rolled,” due to the convex elevation, and has a violaceous hue. The ulcers are exquisitely tender to movement and palpation. On the extremities, the ulcers can rapidly involve muscles and tendons. Ostomy sites are a common location and make care very difficult. In patients who have crohn’s disease, be very cautious of complaints of back pain or buttock pain. Patient’s with crohn’s can get deep tissue abscesses from fistulas that directly spread to back or buttock musculature. Case 1. 45 yo female with left knee injury while doing yoga. Case 2. Pregnant female patient presents with abdominal pain and syncope. Fast exam shows free fluid in Morrison’s pouch. In the setting of early pregnancy with abdominal pain this finding is highly suggestive of ruptured ectopic pregnancy. Patient was diagnosed with ruptured ectopic pregnancy and was taken to the OR. Case 3. 40yo male presents with altered mental status and hypotension. EKG is shown below. Patient ingested a toxic dose of digoxin. To protect the anonymity of the case, I will only give some take home points. Be sure to re-eval sign-out patients who are altered or intoxicated. If you initiate a treatment, be sure you re-evaluate the patient in a timely fashion to assess how the treatment is working and how the patient is doing. ASA, Lithium, Toxic Alcohols (ALT)= things you can dialyze. TCA Overdose EKG. Wide terminal R wave in AVR and wide QRS complex in all leads. Treat with IV bicarb. Ricin is a protein that inhibits ribosomes. It is used as a bioterrorism agent. It is dervied from the castor plant. Foxglove is a botanical cardiac glycoside. Basically it can cause digoxin toxicity. Treat with FAB fragments. Amanita phylloides is the most toxic mushroom. Dr. Carlson noted the “death cup” at the base of the mushroom. Dr. Carlson recommended using IV NAC for all patients with acetaminophen toxicity for practical reasons. Pregnant patients need IV NAC to get better fetal treatment. Dr. Lovell comment: Critical Factoid for figuring out how many grams are in a given volume of solution. %=grams/deciliter. So 0.9% NS has 0.9 grams of saline in a deciliter and by extrapolation, 9 grams of saline in a liter of fluid. Case 1. 55yo male presents bradycardic and hypotensive after beta blocker overdose. Tintinalli algorithm for different modalities to treat beta blocker overdose. Case2. 7 yo male with GSW to the right thigh. Patient is hypotensive and tachycardic. Patient was resuscitated with IV crystalloid and IV PRBC transfusions. Patient had abnormal ABI and soft signs of vascular injury. Patient had CTA showing vascular injury an patient was taken to the OR. Tintinalli algorithm for management of penetrating vascular trauma. Case 3. 4yo male who had non-fatal drowning. If normal O2 sat, normal mental status, normal lung exam after 4-6 hours patient can go home. The most frequent complication of urethral catheterization is infection. Foleys are the #1 cause of nosocomial infections so use them judiciously. Patients are colonized within about a week of an indwelling foley catheter. So diagnose UTI only in symptomatic patients and/or with positive culture results. Dr. Lovell comment: If the nurse can’t place the foley, the emergency physician needs to attempt placement of foley prior to consulting GU. Risk of tracheo-innominate fistula is highest at 7-14 days after surgery. Lubricate the Shiley prior to placing it in the tracheostomy site. You can attempt to oxygenate patients with a mask over the patient’s mouth or over the trach site. Most common cause of tracheostomy bleeding is mucosal irritation. Worst cause is tracheoinnominate fistula. 50% of dialysis catheters develop an infection within 6 months. Bleeding from dialysis graft, treat with direct pressure or quickclot gauze. Consult with Vascular Surgery. Below are some other suggestions from Tintinalli. If G-tube is clogged, first try with flushing with warm water. If that won’t work, your can try cola. If a g-tube site is less than 4 weeks old don’t replace the tube and just consult GI. In the first 4 weeks, the site is not fully mature and replacing the tube could end up in the wrong place. After 4 weeks we need to get the tube replaced as soon as possible to avoid closure of g-tube site. Insulin pumps give a basal rate of insulin and bolus dosing when a patient eats. Patients can also have long term glucose monitors for multiple days in the skin that communicate directly with the insulin pump or an apple watch. Patients who have pumps who are hypoglycemic, treat first with glucose then second disconnect the pump. You can see a patient’s bolus history by reviewing their pump data. Obstruction is more common in the first year after placement. Proximal obstruction is due to choroid plexus and distal obstruction is due to thrombosis. Temp of 38C at home or in the ED is considered positive for fever in the infant. In neonates with fever, the risk for serious bacterial infection is about 13%. The clinical appearance of a neonate does not predict serious bacterial illness. You will need to rely on tests to identify serious bacterial illness in this age group. For patients 0-28 days of age with a fever of 38C or higher, do full septic workup. Get a CXR only for patients with respiratory symptoms such as cough or increased work of breathing. Get a NP swab to screen for RSV. Give ABX within 1 hour for these very young children. (Amp and Cefotaxime) add Vanco if the infant is critically ill or mom was treated for Group B strep. If LFT’s are elevated, get HSV serology and start IV Acyclovir. Elevated LFT’s are a sign of HSV infection. For patients aged 29-60 days with fever, get a CBC, blood culture, UA and urine culture. Urine studies are the highest yield tests. Again, limit CXR’s to patients with respiratory symptoms. Get a Procal, CRP and viral testing. If biomarkers are negative don’t do LP in this age group. If you don’t do LP, discharge without antibiotics. If biomarkers (WBC, Procal, CRP) are elevated, do an LP and start antibiotics. If UA is positive get a blood culture (bacteremia 10%) and consider LP (meningitis 1/200). If you do an LP and decide to treat with antibiotics, give ceftriaxone. Any discharged patient needs arranged close follow up. Infants less than 60 days who are fussy at home and have temps close to febrile (close to 38C) should be observed in ED for a couple of hours and have temp rechecked. Consider getting a CBC, blood culture, UA, and urine culture in these borderline kids. In infants under 60 days, a temp >/=40C indicates a 40% risk of serious bacterial illness. Tips for doing LP’s in infants: put the CPR compression board under the patient to keep the patient from sinking into the bed. After you insert the LP needle through the skin, you can remove the stylet and advance the needle without the stylet so that you can identify CSF as soon as you enter the CSF space. From Dr. Barounis: Here are some takeaways from today's lecture, please share with other residents. I included a lot of the literature that I had obtained for the lecture so feel free to review yourself and see if you come up with different takeaways. CT scans, not V/Q's for sick people please! 1. Massive PE is life-threatening and immediate thrombolysis is recommended by all major societies. At ACMC surgical embolectomy can be considered if immediately available as an alternative in candidates for surgery, or when thrombolysis has been attempted and unsuccessful. DOSE 10mg bolus, followed by 90mg over 2 hours. Consider MOPETT dosing in high bleeding risk patients (see below). 2. Hold heparin when starting tPA as there appears to be no benefit with likely a higher likelihood of bleeding. 3. Obtain a fibrinogen level prior to beginning thrombolysis (same time you are getting PT/INR/PTT). If fibrinogen is dropping consider stopping tPA, hold heparin. 2. The data on ultrasound-assisted thrombolysis has not been consistently shown to improve long-term outcomes, see the ULTIMA trial/ SEATTLE II trial (included below) based on RV/LV ratio @ 3 and 6 months. It did show reduce RV/LV ratio at 24 hours. ULTIMA is the only RCT comparing EKOS to heparin. The PEITHO trial also showed no reduction in PH, or death at 24 month f/u in patients who received tenecteplase vs. placebo. IT APPEARS THERE IS SHORT TERM BENEFIT, but LONG TERM patients own fibrinolytic system appears to do the job. 3. Ultrasound assisted thrombolysis has not shown improvement in clot resolution over plain catheter directed thrombolysis in the only RCT comparing the two (see below, engelberger). Each ekos catheter is around $1,100. 5. Poor prognostic features: tachycardia, tachypnea, hypoxemia, lactic acidosis (>2), PESI SCORE, BOVA SCORE, poor cardiopulmonary reserve. 6. Patients with concomitant DVT and PE have higher inpatient mortality than PE alone. Call 40-0702; please obtain the labs provided in order set (top righ thand side of PERT DOCUMENT included below). You can measure the width of the pericardial fluid to grade the severity of a pericardial effusion. More than a centimeter (10mm) is significant. An echo finding suggestive of tamponade is incomplete filling of RV in diastole. The RV wall will be scalloped. When using echo to differentiate acute PE vs chronic pulmonary hypertension, the RV wall in acute PE will be thin while the RV wall in chronic pulmonary hypertension will be hypertrophied. 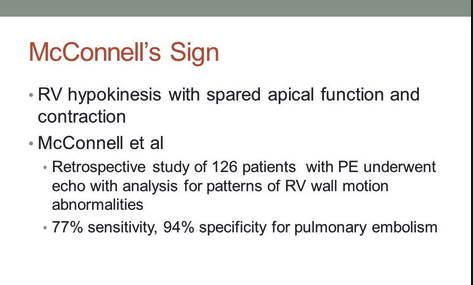 D-sign showing PE. Elevated pressure in the RV flattens the LV septal wall making the LV look like the letter D on a parasternal short view. McConnell sign. The apex of the RV contracts OK despite overall RV hypokinesis. This is a specific sign of PE. Case 1. 75yo female with fever, cough, and wheezing. O2 sat 92%. CXR shows pneumonia. Patient has SIRS. IV fluids and IV antibiotics started. Patient deteriorated late in her ED course with worsening weakness. Son noted that patient has had weakness at the end of each day for weeks now. Patient was diagnosed with Myasthenic crisis precipitated by pneumonia/sepsis. Treatment with plasmaphoresis was arranged. IVIG and steroids are also indicated. Airway needed to be managed due to expected course of illness with worsening weakness. Case 2. 70yo female with cough, shortness of breath and O2 sat of 85%. Patient was cleaning bathroom with a mix of clorox bleach and lime-away. The combo of these cleaning supplies caused strong fumes that overcame the patient. Mixing bleach with either an acid or ammonia can cause the release of chlorine or chloramine gas. The patient was treated with intubation. Steroids should be given to intubated patients with lung injury due to chlorine gas. Case 3. 90yo female presents with scalp rash for about 6 weeks. The rash had a boggy consistency. Diagnosis was a kerion which is more common in pediatric patients and the elderly. Kerion, treat with griseofulvin or fluconazole. Kerion causes hair loss which can help differentiate it from other scalp lesions. Dr. Napier comment: Consider checking LFT’s as a baseline prior to starting griseofulvin. RV/LV ratio 0.9 or greater is a sign of RV strain on CTPE study. Massive PE patients are candidates for systemic TPA. Sub-massive PE patients are candidates for catheter directed thrombolysis. Patients with a low risk of bleeding who have RV dysfunction and elevated troponin are probably the most likely to benefit from catheter direct thrombolysis in the submassive group. High risk PESI scores warrant consideration of ICU admit. 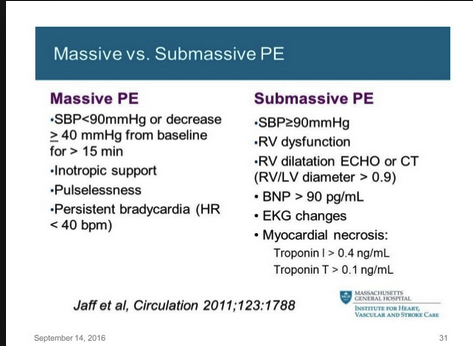 50% of patients with massive PE have a contraindication to TPA. This slide just gives an idea of the total incidence of PE and PE deaths in the US. As a comparison MVC’s account for 30-40,000 deaths/year and drug overdoses account for approximately 80,000 deaths/year. Type 1 DM has a genetic component but it is not all genetic. Only 40% of identical twins will have Type 1 DM. DKA patients are more dehydrated than they look because they are losing intracellular water with glucose in the urine rather than water and sodium in the stool. Expect DKA patients to be potassium depleted. Begin replacing potassium very early in the management of DKA. Younger kids, those with limited access to care, and low BMI kids are more likely to present in DKA and are more likely to have a delay in diagnosis. If a patient has an insulin pump and presents in DKA, turn off the pump and treat with IV insulin. It is better to have complete control of the insulin the patient is receiving. There is no indication to give an initial bolus of insulin. Just start a continuous drip drip after first priming the line with insulin. The IV tubing adheres the initial insulin and if you don’t first prime the line with insulin, it can take hours before the patient starts receiving insulin because the infusion is getting absorbed by the IV tubing. 10ml/kg bolus is probably fine and safe as your initial fluid administration. Use LR to avoid hyperchloremic acidosis associated with NS. 1,389 distinct episodes of DKA were evaluated in 1,255 patients, but only 1361 episodes of DKA were included in the primary analysis. 132 children had a second episode of DKA and underwent randomization as well. There were a total of 48 episodes (3.5%) resulting in a GCS <14 with 22 episodes (1.6%) requiring hyperosmolar therapy for cerebral edema, and 12 episodes (0.9%) of clinically apparent brain injury. HEART Score was validated on 2440 patients in the Netherlands. Procainamide works better than Amiodarone for stable v-tach with less adverse events. Initially attempt to treat SVT with postural modification to valsalva maneuver. Put head of bed at 40 degrees and have patient blow in syringe for 15 seconds. Then lay patient flat and raise legs. Then sit them back up. Try this modified valsalva maneuver to terminate SVT. It works 25% of the time. Dr. Lovell comment: If patient has alot of anxiety about adenosine, consider propofol to sedate patient. Olfactory distraction works for nausea. For patients who don't have an IV and have nausea, Inhaled isopropyl alcohol from an alcohol wipe works as well or better than zofran. Consider this for a patient with nausea. Patients get relief for 30-60minutes. 5mg IM was very effective for gastroparesis symptoms. In patients with CKD/ESRD, 5u of insulin works just as well as 10u of insulin with much less hypoglycemia. For stones in the distal ureter, 4-7mm, flomax worked better, faster, with less painful passage of stone. Number needed to treat is high though. Avoid flomax in patients with risk factors for CAD. Bicarb for anion gap acidosis in the ICU did not lessen mortality or organ failure but it did decreased the need for dialysis. Dr. Lovell: This study is a game changer for acidotic patients. Most of these patients with anion gap acidosis had sepsis. Normotensive PE patients with RV strain on echo who got TPA and heparin did not have improved mortality compared to heparin alone. TPA patients did have greater adverse bleeding outcomes.